After a deliberative process to receive and consider member company input, the MCC's board of directors recently approved the organization's 2019 Policy Priorities. This statement reflects the industry's highest priorities for legislative and regulatory advocacy. On Wednesday, February 6th, the MCC held its 2019 Policy Day at the Capitol, which featured speakers from the MDEQ, the Governor’s office, and the Legislature. MCC members also discussed the organization’s 2019 legislative and regulatory policy priorities, including issues like PFAS, energy competitiveness, infrastructure, and chemicals regulation. The Michigan State Police (MSP) Emergency Management and Homeland Security Training Center (EMHSTC) hosted an open house event for more than 30 private industry professional on Monday, June 4th. Members of the Michigan Chemistry Council, as well as railroads and other industries, gathered to learn more about this facility and the cooperative work that is done to train first responders and private sector professionals. Open house participants saw hands-on demonstrations from members of the MSP bomb squad, as well as the 51st Civil Support Team from the Michigan National Guard. On Tuesday, September 12th, MCC Executive Director John Dulmes, along with Josh Lunger of the Grand Rapids Area Chamber of Commerce, testified before the House Energy Policy Committee. The hearing focused on the issue of electric choice and the Michigan Public Service Commission's (MPSC) implementation of the new energy law (PA 341). In particular, the MCC and other parties supporting electric choice are concerned about the potential mandate for a Local Clearing Requirement (LCR) that would restrict options for the use of capacity by Michigan energy providers, and unnecessarily drive up costs. Two of Michigan's best STEM contests, the "You Be The Chemist" and the Michigan Science Olympiad, each held their state competitions on Saturday, April 29th. A number of Michigan chemistry companies led efforts to organize and support these events, and the MCC was excited to share the day with these amazing students, teachers, and families as they competed in Troy and East Lansing, respectively. The MCC's Education & Workforce Committee continues to work to connect the business of chemistry with our future workforce - give John a call or check out an upcoming committee meeting to see how you can get involved! MCC Executive Director John Dulmes recently participated in the Michigan Science Teachers Association (MSTA) 2017 Conference, held March 23rd - 25th in Novi. Over 1,500 educators attended this year's event to learn about new curriculum standards, proven teaching methods, and ways to incorporate real-world learning into their classrooms. The MCC was featured with an exhibition table at which we showcased Michigan's chemistry products and information about our industry, as well as solicited input about future opportunities for industry-educator interaction. We had a blast talking with these teachers, and we plan to use their feedback to develop our offerings, currently being led by our Education & Workforce Committee. Michigan’s agriculture and manufacturing sectors are leading job creators in our state, and as they become even more productive, businesses need competitive options to move their products. 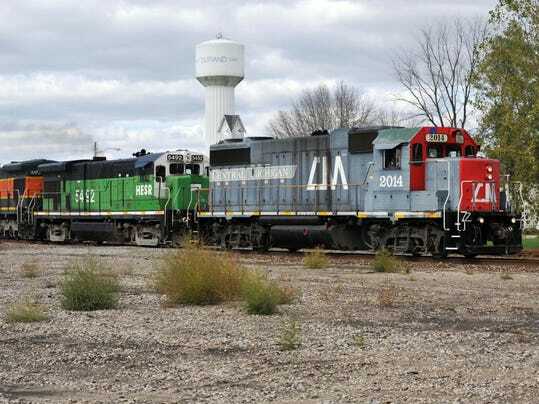 Freight rail must continue to be a big part of the equation, and that’s why the Michigan Agri-Business Association and the Michigan Chemistry Council are calling for long-overdue changes to our nation’s archaic freight rail policies. Many industries in Michigan use natural gas – including the power, residential, commercial and transportation sectors. A lesser-recognized but equally important trade that has benefited enormously from the recent American natural gas renaissance is chemical manufacturing. While most people are instinctively familiar with everyday products like shoes, clothing, packaging, tires, paints and carpeting – they may not realize that many of these products are made through chemistry with materials derived from natural gas. And in the past decade, we’ve seen unparalleled opportunities for the business of chemistry in Michigan and across the United States because of abundant sources of domestic natural gas in the Marcellus and Utica shale formations. The Michigan Chemistry Council (MCC) and a number of friends in industry and government recently came together to celebrate a notable occasion: the 25th anniversary of the dedication of the state’s Hazardous Materials Training Center. The development of this facility, which is still in active operation, represents a significant public-private partnership to address a major priority for the state of Michigan. In looking back upon this history, the MCC and its members are proud to have played a lead role in this worthy cause. 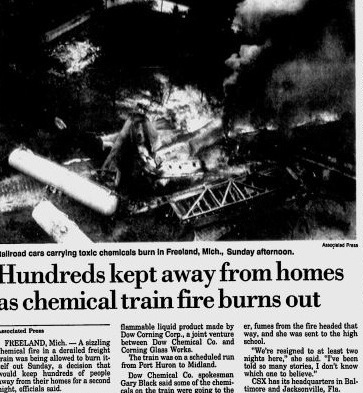 During the late 1980’s, there had been great attention to the issue of rail safety, particularly with regard to hazardous materials. A number of high-profile derailment incidents within the state led to heightened public awareness and investigations by the legislature. One of the major recommendations was the development of a permanent facility to provide increased hazardous materials emergency training to local first responders. On July 29th, the Federal Energy Regulatory Commission (FERC) released a final environmental impact statement (EIS) for the Rover Pipeline. FERC’s extensive review process incorporated findings from a wide range of analyses, input from stakeholders gathered over the course of more than ten public comment meetings, and recommendations from other federal and state regulatory bodies. Ultimately, FERC concluded that Rover would be able to successfully mitigate its environmental impacts through enacting its detailed planning and FERC recommendations. The Michigan Chemistry Council (MCC) was extremely encouraged to see FERC take this important step in the approval process of the Rover Pipeline. Our region currently suffers from a dearth in midstream pipeline infrastructure – while a wealth of domestic natural gas is in production in the Marcellus and Utica shale formations, businesses and manufacturers in Michigan are unable to tap into those resources. The Rover Pipeline would readily grant that access, providing our energy-intensive members with affordable natural gas to produce the many everyday consumer products that our customers rely on. Last week, a wide range of stakeholders and a vast majority of legislators from both political parties came together to make history: they helped to overhaul a major federal law that hadn’t been updated since it was signed in 1976. This law, the Toxic Substances Control Act, oversees the federal regulation of chemicals in commerce. As more than 96 percent of all manufactured goods are directly touched by the business of chemistry, the TSCA law is an extremely important one for businesses, consumers and the environment. There has been much written about the importance of natural gas to the members of the Michigan Chemistry Council. Natural gas heats and powers homes, generates electricity, and is even used to create fertilizer, plastics, pharmaceuticals, dyes, and detergents, among a litany of everyday products consumers rely on. There are two recent studies that illustrate the benefits of expanding our region’s access to natural gas through the construction of midstream infrastructure. Jeffrey Guilfoyle, a vice president of Public Sector Consultants (PSC), recently appeared before the Michigan House of Representatives Committee on Energy to present an economic impact study on oil and natural gas in Michigan. The report, titled “Michigan’s Oil and Natural Gas Industry: Economic Contribution,” details the positive effects that the development of our state’s natural resources have generated. Most Michiganders are familiar with natural gas as the fuel that helps us keep our homes warm and comfortable in the winter. We may also use it to cook our meals, heat our water, dry our clothes, and light up our fireplaces. Gas does all these jobs safely, efficiently, and affordably. For rent, available immediately - office space in downtown Lansing, directly across from the Capitol building. One dedicated, private office furnished with desk, file cabinet, and built-in bookshelves. Use of an adjacent office space with desk, bookshelves/storage, and work/break area. All located directly across from Capitol building and within minutes' walk of major state office buildings. Please contact John at 517-372-8898 or [email protected] for more information. Imagine if every time you stopped to buy gas, you spilled two gallons for every one you put in the tank. That’s exactly what happens with energy wasted at factories and power plants across Michigan and the rest of the country: for every barrel of oil or ton of coal burned to generate power, two-thirds of the potential energy is lost – enough energy lost nationwide to power the entire country of Japan. What if we could capture that lost energy and use it, thereby increasing the efficiency of Michigan’s power plants and factories? Well, there are commercial technologies that do just that; they capture waste energy, the best clean energy source available. Combined heat and power (CHP) produces both heat and power from a single source of fuel, which provides double the efficiency of traditional power generation. Waste heat to power (WHP) captures waste heat that would typically be vented from an industrial facility and uses it to make electricity without additional fuel or emissions. Both of these “cogeneration” technologies dramatically lower energy use, emissions, and costs; thereby creating jobs, increasing private investment, and improving the competitiveness of Michigan businesses. It’s no secret that the U.S. auto industry is riding a major hot streak, with car sales surpassing more than 17 million last year. American automakers are turning out loads of innovative new models that deliver not only performance, style, and comfort - but increasingly, environmental sustainability. This year’s North American International Auto Show (NAIAS) offers plenty of proof that consumers are demanding “green” cars, and that automakers are turning to chemistry for the solutions. Michigan’s chemical industry has long been a key supplier to Detroit. Chemicals are essential in the production of automotive adhesives, coatings, plastics, composites, batteries, rubbers, fluids, and many other components. In fact, the average vehicle made in the U.S. and Canada already contains over $3,500 in chemistry products. As automakers strive for improved environmental performance, many of Michigan’s chemical companies are stepping up to meet these sustainability challenges. On February 19th, the Federal Energy Regulatory Commission issued a Draft Environmental Impact Statement (dEIS) that assesses the potential environmental effects of the Rover natural gas pipeline project, as well as details for the next hearings the agency will hold in communities in our state. The release of the draft EIS is a step in the right direction toward final approval of this important project. The Rover pipeline represents a tremendous opportunity to create jobs and provide our country with energy security. The pipeline will create 10,000 local construction jobs and provide $4.2 billion of investment into state and local economies. One could say that the chemical manufacturing industry makes the world go round. More than 96 percent of all manufactured goods are directly touched by the business of chemistry. Every new home built in the U.S. contains over $15,000 of chemistry products, while every light car produced in the U.S. contains over $3,500 of chemistry products. For Michigan, home of America’s major automakers and the 13th-largest chemical-producing state in the nation, the chemical industry is particularly vital. At $15.5 billion, chemistry is the third-largest manufacturing sector in Michigan. Chemical manufacturing provides approximately 30,000 direct jobs and another 90,000 related jobs in Michigan, including more than 34,000 jobs in plastics and rubber products.